“Scoffers will come in the last days with scoffing …. They will say, ‘Where is the promise of his coming? For ever since the fathers fell asleep, all things are continuing as they were from the beginning of creation’” (2 Peter 3:3–4). As we saw yesterday, the apostle Peter wrote his second letter in order to help the church recognize and stand against false teaching. He does this not only by describing the false teachers and their heresies, although that is a component of his letter (chap. 2, for example). He also helps his audience stand against false teaching by pointing them to the basic doctrines and predictions given in the writings of the prophets and apostles (3:1–2). In today’s passage, Peter points us to the predictions of the prophets and apostles in order to give us confidence that false teaching is in fact no surprise to God. For the apostles and prophets did predict that in the last days scoffers will arise deriding the promise of Jesus’ return (vv. 2–4). The questions and assertions of the false teachers described in verse 4 were not innocent inquiries regarding the second coming; rather, the teachers in question mocked the orthodox belief in Jesus’ return as Judge. However, this should not be surprising to us. Peter does tell us that the scoffing of the false teachers is predicted by the Word of God. In view here are passages such as Malachi 2:17 where the prophet warns the people that they have wearied the Lord by speaking as if God is not concerned with justice. As false teachers do the same in these last days, Malachi’s warning is fulfilled and made all the more intense because those who deny judgment while living under the revelation of the new covenant are even more guilty of sin. Peter’s quotation of the prophet Joel in Acts 2:16–21 makes it clear that the entire time between the first and second advent of Christ is to be regarded as the last days. As such, we are not to be surprised at the presence of false teaching throughout church history, nor are we to assume necessarily that the seeming proliferation of false doctrine in our own day means that Jesus will return in our lifetime. 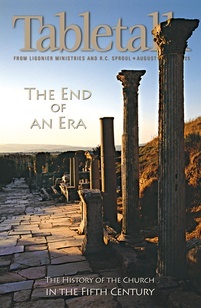 Jesus could return at any time, and yet the entire period between His two advents is indeed the last days. Thus, we must not be surprised that the predictions about the rise of false teachers (Matt. 24:11) are fulfilled in every generation of the church. Are you distressed by what appears to be an increasing amount of aberrational teaching in the church? While in one sense it is good to be disturbed by false doctrine, we must never think that its presence surprises God or can thwart His plan. Moreover, we cannot let the fact that false teaching will certainly arise make us complacent in fighting against it. Ask the Lord to increase your trust in Him so that you may stand firm and not worry when you encounter false doctrine.